The easy way for Montessori Educators to help bridge the communication gap between home and school! Extraordinary things happen at your Montessori school every day – don’t keep them a secret! The occasional 30-second conversation with a parent at pickup/drop-off doesn’t tell the whole story. Phone conversations or in-person meetings can be difficult to schedule and time-consuming. Montessori Compass simplifies parent communication, resulting in a more personalized connection with the school community. MC makes it easy to share academic progress, social development, and those wonderful moments of childhood spontaneity that help make your classroom such an enjoyable place! Parents rejoice! Finally, there is an easy way to stay connected to your child’s school! No more scouring the minivan floors in search of that missing monthly school newsletter (ummm…been there, done that). 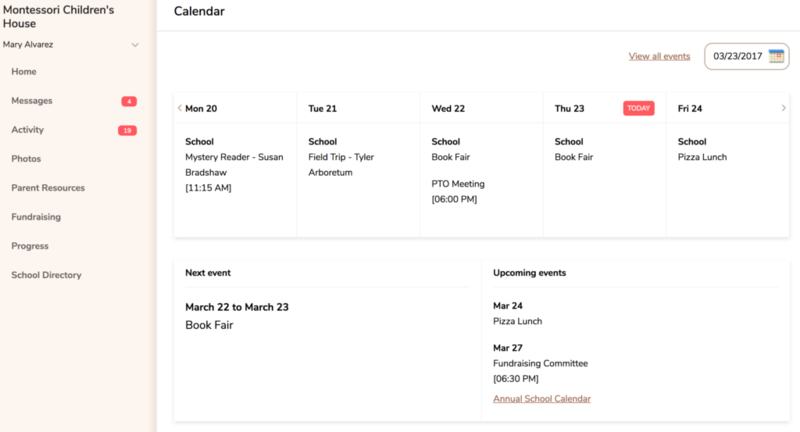 Busy parents can simply access important school information in real-time from any computer or web-enabled mobile device (i.e. iPhone, iPad, Android, etc.) Each parent website is password-protected and personalized to contain only the information that is relevant to the designated user’s family. Like placing a sticky note in a child’s backpack on the way home from school! Activity Reports help answer the age old question for parents… what did my child do at school today! This optional report can be customized per classroom and automatically delivered to parents on a daily or weekly basis. Schools can choose to include lessons, notes, and/or trackers (i.e. naps, toilet training, meals, etc.) This brief summary of the child’s day helps make family time even better as parents can engage their children in a real conversation about their school day! This just in… parents LOVE to see photos of their kids! MC makes it easy to share online photos of classroom activities. 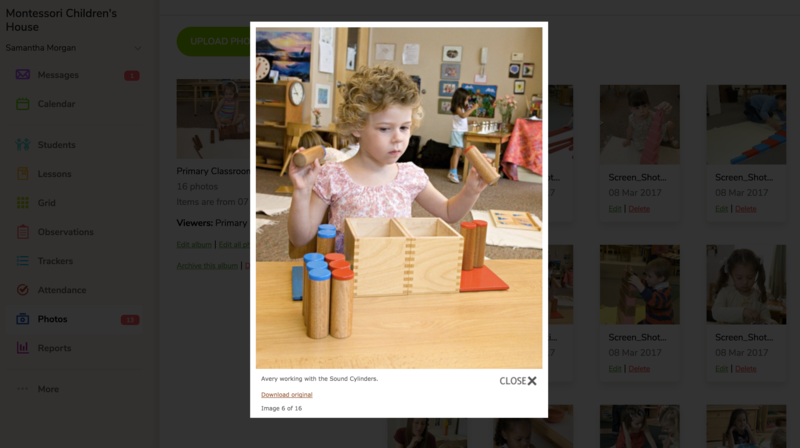 Photos can be uploaded to your Montessori Compass account and instantly shared with your students’ adoring fans (i.e. their parents.) Photos are tagged to designated parent accounts, so parents only see what is relevant to them. To protect privacy, only users with a school-authorized, password-protected MC account can access photos of classroom activity. 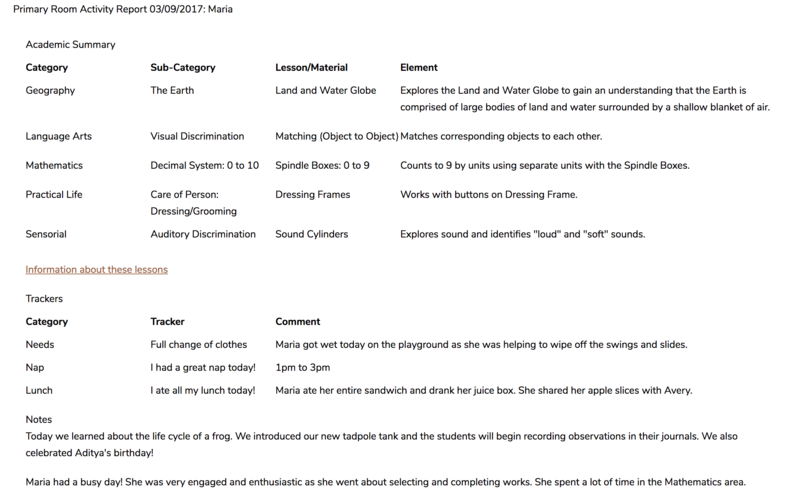 Generate custom Montessori Progress Reports! Even the most engaged parents can find it challenging to effectively understand their child’s progress in the Montessori classroom. Montessori Compass makes it easy for parents to see tangible evidence of their child’s academic and social development in an easy-to-read format. 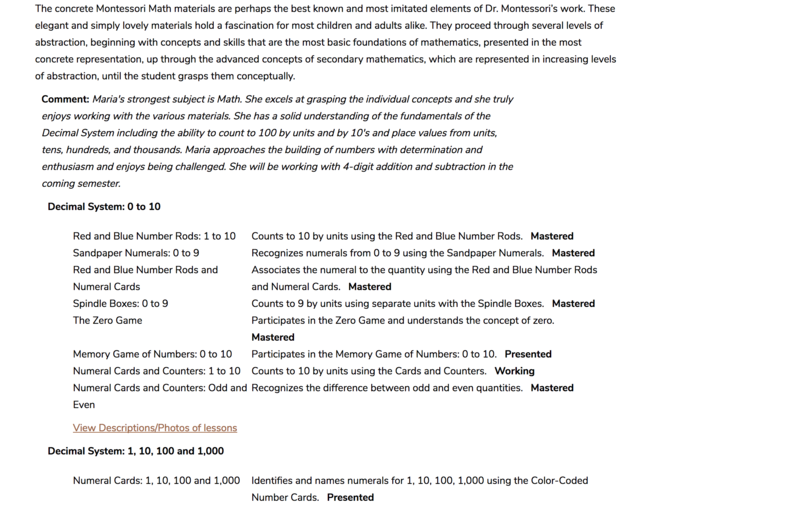 MC’s comprehensive Online Montessori Progress Reports compile all of the lessons presented to the student over the selected period of time and may include personalized notes from the teacher. Parents can view student progress reports on the web via the parent portal. You may also choose to download/print a PDF and deliver to parents outside of the portal. Progress Reports are highly customizable, giving you the ability to opt-in/out of sections including a customizable Skills Report and the Standards Report. Helping to turn Montessori Parents into Montessori Advocates! Has a parent ever asked you about Metal “Insects”? Parents choose a Montessori education for many reasons, but few truly understand what the Montessori Method is all about. 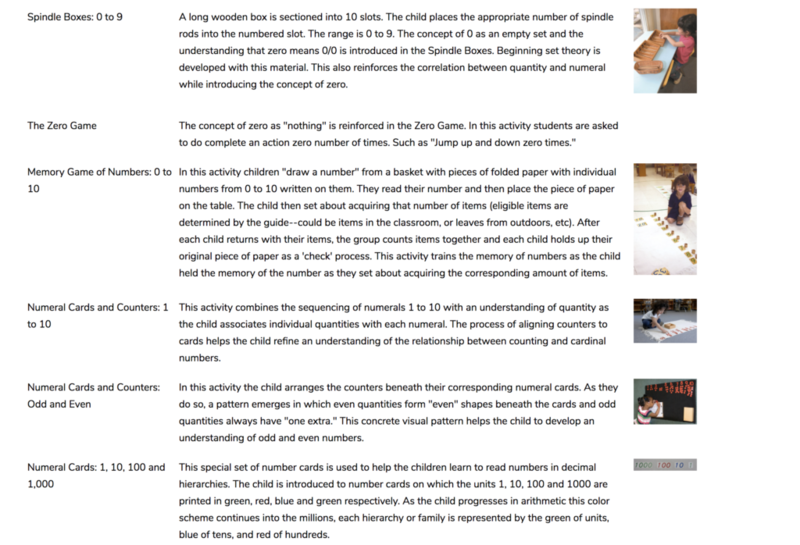 There is a learning curve with the unique terminology used in the Montessori classroom, especially for new parents. MC aims to help educate the parents alongside the child by sharing customizable photos & descriptions of common Montessori works (i.e. it’s Metal Insets, not Insects!) Increased awareness of the many benefits of a Montessori education leads to increased appreciation. The end goal is to help turn parents into advocates for your school and the greater Montessori community! MC makes it easy to connect with other parents! Parents who have ever tried to organize a birthday party or play date for their child will appreciate the convenience of having an easy way to connect with other parents. Messages are instantly sent via Montessori Compass messaging – not email. Therefore, all personal information (email addresses, phone numbers, etc.) are always kept confidential. 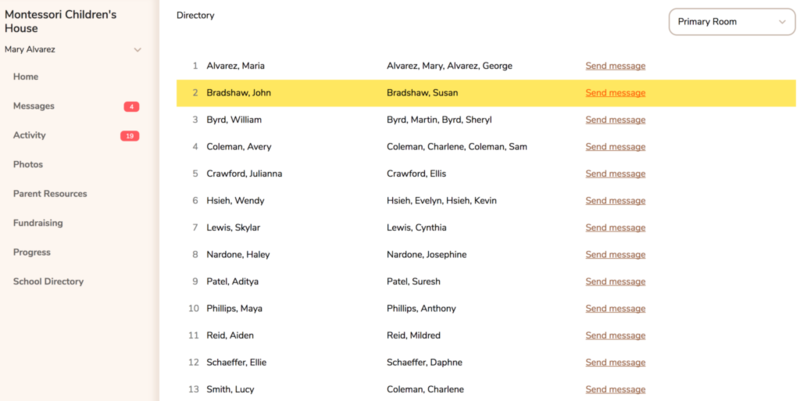 This allows schools to leave it up to the parents as to what information they would like to share and with whom.